Make sure to subscribe to my Youtube channel if this kind of commentary is up your alley. When it was announced the Ben Affleck would be the Dark Knight in 2015’s ‘Superman vs. Batman: Dawn of Justice,’ I said that if director Zack Snyder were smart, then he would tell his new hire to stick to movie-talk. I said Mr. Affleck lives in a Hollywood bubble, where everyone thinks along the same lines and tells each other how smart they are at cocktail parties, and that he generally has a hard time discussing politics without alienating fans (e.g., When he sees a Republican actor on screen he thinks, “I probably wouldn’t like this person…”). 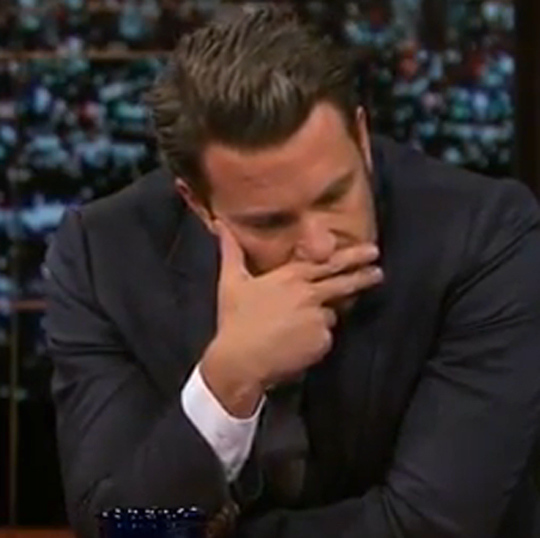 His near-meltdown on Bill Maher’s Real Time on Oct. 3 proves nicely that Mr. Affleck doesn’t know how to deal with smart people who disagree with him. 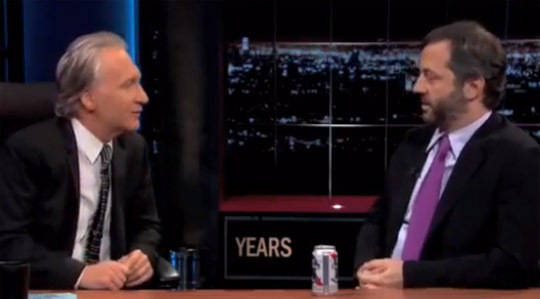 Consider this discussion between next summer’s Bruce Wayne, Bill Maher and author Sam Harris. Sam Harris: Liberals have really failed on the topic of theocracy. They’ll criticize white theocracy. They’ll criticize Christians. They’ll still get agitated over the abortion clinic bombing that happened in 1984, but when you want to talk about the treatment of women and homosexuals and free thinkers and public intellectuals in the Muslim world, I would argue that liberals have failed us. Ben Affleck: Thank God you’re here. Sam Harris: The crucial point of confusion is that we have been sold this meme of Islamophobia, where every criticism of the doctrine of Islam gets conflated with bigotry towards Muslims as people, and that’s intellectually ridiculous. 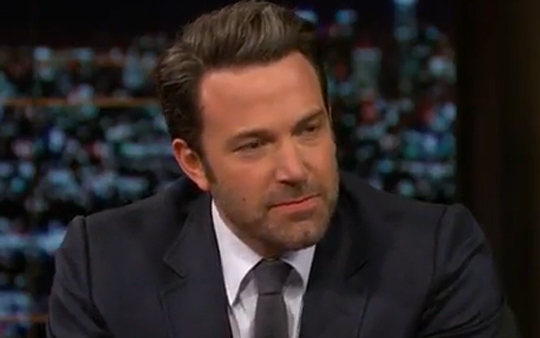 Ben Affleck: Are you the person who understands the officially codified doctrine of Islam? You’re the interpreter of that? Same Harris: I’m actually well-educated on this topic. Ben Affleck: I’m asking you. So you’re saying that Islamophobia is not a real thing? Sam Harris: I’m not denying that certain people are bigoted against Muslims as people. In short, Ben Affleck was a petulant man-boy. 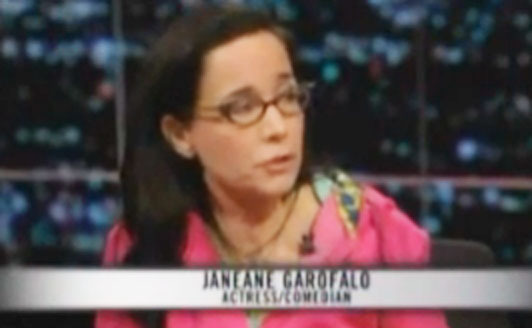 Faced with actual statistics about female genital mutilation in the Middle East and Africa, the percentages of Muslims who believe a man should be killed for leaving the religion, and troublesome data regarding opinions on free speech — in Western countries — Ben Affleck’s response was to call Bill Maher a “racist,” to say he “doesn’t understand idiots,” and that “we’ve killed more Muslims than they killed us by an awful lot,” (as if George H.W. Bush, Bill Clinton, George W. Bush and Barack Obama all just have a thing for militarily engaging Muslim countries for no other reason than to kill Muslims). 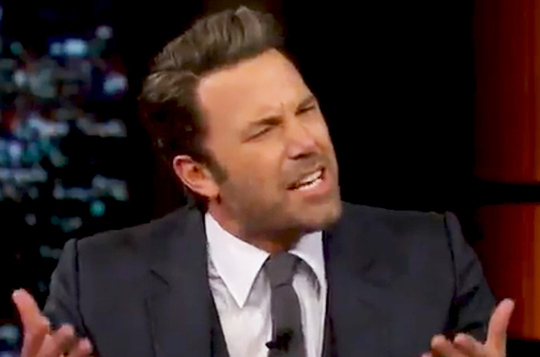 Ben Affleck says that the Islamic State group couldn’t fill a “AA ballpark in West Virgina,” while ignoring the fact that it only took 19 al Qaeda terrorists to bring down the World Trade Center Towers on Sept. 11, 2011. Shall I go on? In less than 10 minutes, the man who will play Batman next summer makes it close to impossible for millions of moviegoers to see Zack Snyder’s film with an open mind. The so-called defender of Gotham is, in real life, a man who can’t even defend his own political position without looking like he might cry on national television. He had no problem mocking Catholicism in Dogma, but yet he and his buddy Kevin Smith would probably consider it “racist” to appear in a similar film titled “Fatwa.” Telling. Bill Maher is a very confused atheist. On one hand he mocks religious people for believing in God, but on the other hand he gives interviews with PETA where he laments the fact that Liam Neeson favors crushing the “spirits” of horses in New York City. Horses have “spirits,” according to the guy who thinks that humans are all just a bunch of atoms and molecules and random electrical impulses that just-so-happen to collide in ways that make life (and the illusion of free will) possible. HBO’s Real Time host Bill Maher is no longer a fan of actor Liam Neeson. 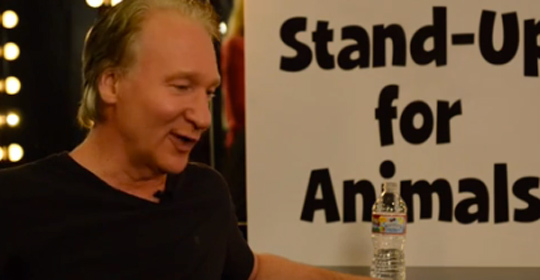 In a new video posted Wednesday by People for the Ethical Treatment of Animals (PETA), Maher railed against Neeson’s support for New York City’s controversial horse carriage business. Someone needs to inform atheist Bill Maher that for guys who believe we’re all just a bunch of random electrical signals following a program we can not control, words like “should” and “spirit” are a no-no. If we’re all essentially running on a computer program that will end in black, why does he care what Liam Neeson advocates for or against? In fact, if the Real Time host wasn’t so intellectually confused he would say that Liam Neeson has no choice but to advocate for horse-and-buggy rides in New York City because that’s what his computer program is telling him to do. Are we just a complex computer program that luckily wrote itself with the creation of the universe, or do we have free will? If we have free will, then Maher is in for a whole new load of headaches. Perhaps we should cut Bill Maher some slack, since even Stephen Hawking finds himself aimlessly wandering around inside a paradox — or perhaps not since Bill Maher regularly says really mean things about people who believe in spirits, the soul and a non-local consciousness that directs and guides us. 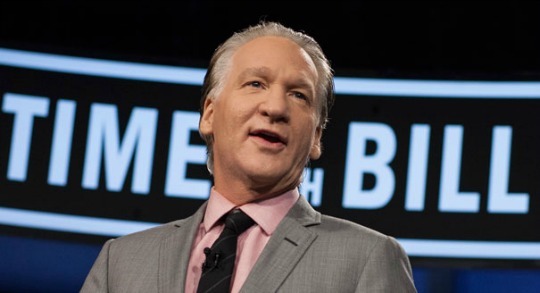 The point is this: Bill Maher might want to think twice the next time he mocks religious individuals, given the fact that he now finds himself defending the spirits of horses, which his atheism demands he must deny. The Washingon Post’s coverage of a Pew poll on the world’s Muslim’s is one of the funniest things I’ve read in awhile. According to Pew’s data, 78 percent of Afghan Muslims say they support laws condemning to death anyone who gives up Islam. In both Egypt and Pakistan, 64 percent report holding this view. This is also the majority view among Muslims in Malaysia, Jordan and the Palestinian territories. It’s also important to note that majorities of Muslims in the countries surveyed, sometimes vast majorities, said they support religious freedom. That includes, for example, more than 75 percent of Egyptians and more than 95 percent of Pakistanis. It might seem like a glaring contradiction. And it is a contradiction, but it might make a little more sense that so many people could hold seemingly mutually exclusive views — religious freedom is good, but anyone who leaves Islam should be executed — if one understands the particular history of apostasy in Islam. How sad is it when a guy has to put a smiley face on the fact that only 36% of Bangladesh’s Muslim population wants you dead if you leave the faith. And hey, only 16.6% of Tunisians feel the same way. 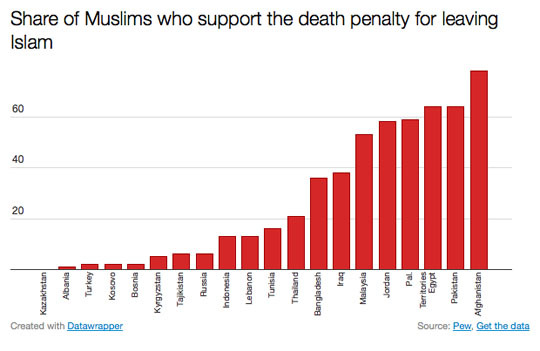 The topper is that “sometimes vast majorities” of Muslims in these countries “support religious freedom.” Got it. And by “got it” I mean I do not. But that’s okay too, because Mr. Fisher assures us that we all need to do is a better job understanding the history of Islam; once we do that we’ll be good to go. Bill Maher points out that no one would be able to write “The Book of Islam” as a musical, and the professor’s only comeback is “I have nice Muslim students.” And yet, at the end of the segment the two are giving each other high-fives when they agree that the primary reason why militias and patriot groups have been created in great numbers since President Obama took office is probably because “white guys don’t want to see a black guy on Air Force One.” Interesting. Now if you’ll excuse me, I have to go to bed. It’s late, and I have an old friend from The Heritage Foundation I’m meeting for breakfast. Maybe the answer will come to me while I sleep. Either Bill Maher has been watching Dinesh D’Souza videos, or he has been playing Oregon Trail. Whatever the case, it seems as if something went off in his head because he’s finally acknowledging that there are an awful lot of people asking for an awful lot from the American taxpayer. Or perhaps Maher and D’Souza have the same accountant, and the guy explained the situation to each of them using the same wagon metaphor? Who knows. And here, listen to this about disability. People who take disability, who are on disability, in 1968 it was 51 to1, people on disability to people who worked. In 2001, not that long ago, it was 23 to 1. Now it’s 13 to 1, 13 people to one who are on disability. Now, of course, you know, some of that is real. We are an overworked, overstressed, polluted, ripped off and lied to people. So, I mean, obviously there are some people who really do have disabilities. But 13 to 1? You know, it just seems like there’s less people pulling the wagon and more people in the wagon, and at some point the wagon is going to break. Dinesh D’Souza: I’m simply saying that here we are as a country and for two centuries we’ve had people pulling the wagon. And we recognize, and I would agree, that there is a group of people — and you can disagree about how many — but I would say about 10 percent of people are weak and disadvantaged and need to sit in the wagon and need to have the rest of us pull that wagon. Again, you can disagree about how many people should pull the wagon, but that number [of people sitting in the cart] has been increasing considerably. This is sort of what Romney was getting at. That at some point there are more people in the wagon than there are pulling. And then the people who are pulling begin to think, “Maybe I should stop pulling and get in the wagon. It’s kind of nicer in the wagon.” And what my criticism of Obama is, instead of saying: “Listen, I really want to thank the people who are pulling the wagon,” he goes, “The people who are pulling the wagon are greedy, selfish and materialistic, and the people sitting in the wagon are wonderful.” He is morally demonizing the wagon-pullers and championing the superior morality of the guys who are sitting int here. And all I’m saying is, this is an inverted morality. The guys who are actually contributing to help the disadvantaged, these are the sacrificial members of our society, and they’re the ones who deserve a little more credit. Bill Maher is a conundrum. He’s dumb enough to publicly say that “socialism works,” but he is smart enough to identify some of the accounting problems exacerbated by its philosophical implementation. Given that, one must assume that his real problem is that he’s just dishonest. He knows what’s on the horizon. He knows that we are speeding toward that cliff. He knows that the great big debt-tower is going to come crashing down. He knows it’s all a matter of time, but because he wedded himself to a philosophy years ago, he now spends most of his time figuring out ways to obscure its failures. And like Darth Vader, somewhere deep down inside there’s still a piece of him that seeks to do the right thing, and from time to time he’ll say something that makes his droids squirm. 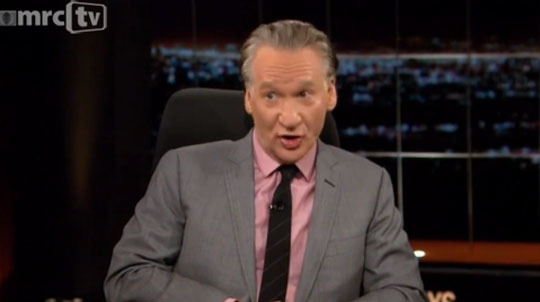 Think about it: Bill Maher, the guy who donated $1 million dollars to Obama’s SuperPAC (and all he got were higher taxes) is now on the same page as the guy who starred in 2016: Obama’s America. Classic. Poor Bill Maher. He's so busy making up hilarious lies about Republicans that he can't even see that his head is wedged between the nation's massive debt and the percentage of our GDP it takes up. Bill Maher fancies himself a funny guy. Personally, I think he’s a poor man’s George Carlin, an atheist without Carlin’s intellectual curiosity about the human condition or the polish that shines when someone truly loves their craft. Regardless, I watched the entirety of his Yahoo stand up routine, CrazyStupidPolitics because it’s important to never let yourself become isolated from differing points of view. I might not agree with George Carlin’s analysis of The Ten Commandments, but I know talent when I see it—and he had it. 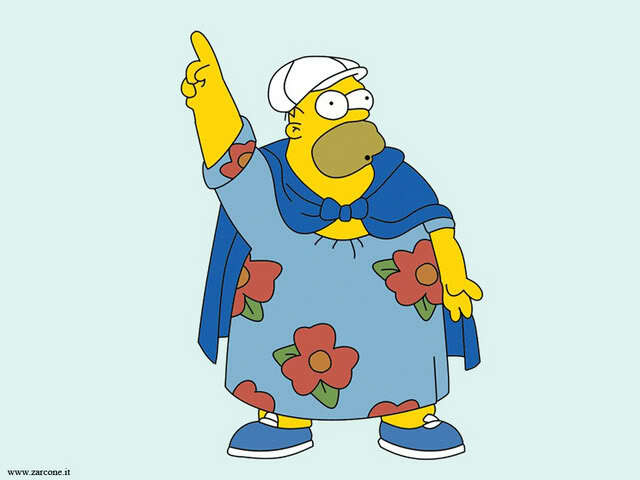 Maher? He’s just a bitter liberal guy who strings together pseudo-witty personal attacks on people he doesn’t like. He’s essentially made the same handful of jokes over and over again for the last decade (e.g., religious people are dumb, Republicans hate poor people and black people). And that’s fine. I eat the same thing for breakfast every morning and I never get tired of it, just like people who hate Sarah Palin never get tired of hearing the same jokes recycled from the 2008 presidential campaign. It’s just a shame I don’t get paid big bucks to eat raisin bread with peanut butter like certain comedians get paid to tell slightly different iterations of the same stale routine…but I digress. Since Bill likes black and white numbers I went to the Obama Administration’s 2013 Budget. 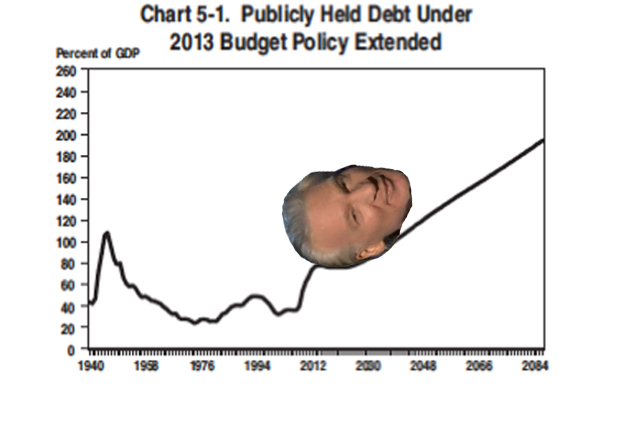 The graph provided above, with Bill’s rolling head added as a bonus, shows the incredibly sharp slope our nation’s debt takes on the not-so-distant horizon, so much so that the comedian’s cranium get’s wedged between the debt and the percentage of American GDP it takes up. That’s not coming from me, the so-called racist conservative—that’s coming from the administration Bill Maher just donated 1 million dollars to through a SuperPac (those vehicles for influencing elections that Barack Obama was against until the money came rolling in). Entitlement spending on Social Security, Medicare, and Medicaid—and now with Obamacare—are the primary drivers of our debt. FACT. “Beyond 2022, however, the fiscal position gradually deteriorates mainly because of the aging of the population and the high continuing cost of the Government’s health programs. By 2030, the deficit is projected to be 4.5 percent of GDP, and by 2040 it is nearly 6 percent. The deficit continues to rise for the next 75 years, and the publicly-held debt is also projected to rise persistently relative to GDP (see Chart 5-1),” (Obama Administration 2013 Budget, emphasis added). In short, the very thing liberals want more of is the very thing that is going to bring the nation to its knees. Instead of honestly talking about it with the American people, entertainers like Bill Maher gin up hate, animosity, and anger. Bill Maher is laughing all the way to the bank, but it’s his fans who aren’t going to think it’s funny when the economy crashes and burns. Now if you’ll excuse me, I have some Demetri Martin to listen to.